Tying a leader to a srtring — Gamut Music. Inc. Leaders are additional, usually thinner, lengths of gut tied at one end of a string. These are useful when you have a string with a large diameter and don’t want to enlarge the hole in the peg or tailpiece to accommodate it. This series of instructions shows the process of attaching a leader to a string for tuning at the peg, but the same method can be used for connecting a string to a tailpiece if needed. Install one end of the string in the tailpiece as usual. Stretch the string out to the nut. Mark the string about 1/4”, (6.5mm), from the edge of the nut. Cut the string at that point. Burn the end of the string so that there is a small mushroom shape at the end. Use another string with a smaller diameter to make the leader. Usually, something in the range of .90mm - 1.06mm is a good choice, but just make sure it is small enough to fit through the hole in the peg. 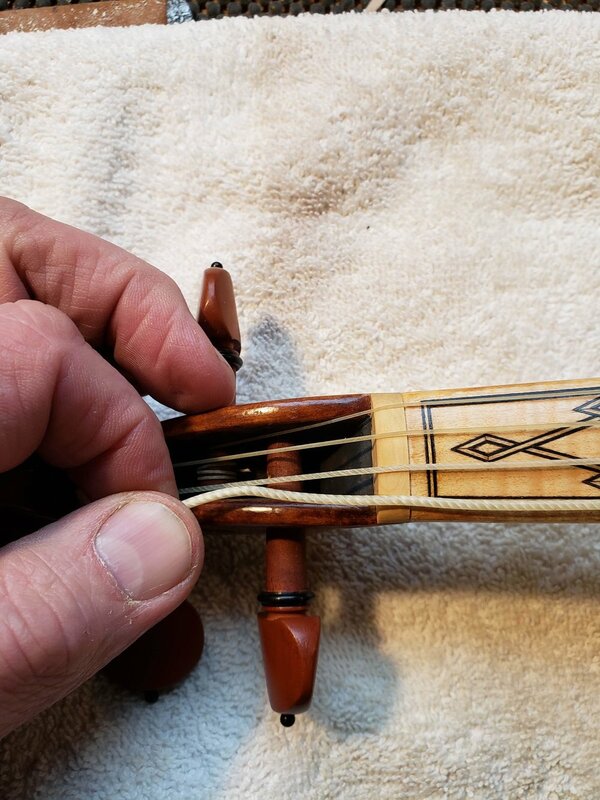 Continue to pull the end around toward the fingers holding the string. Put the end through the loop you just made. Holding the loop, pull the end so that the knot tightens on the leader. Cut the end to about 1/4”, (6.5mm). Burn the end down to the knot. 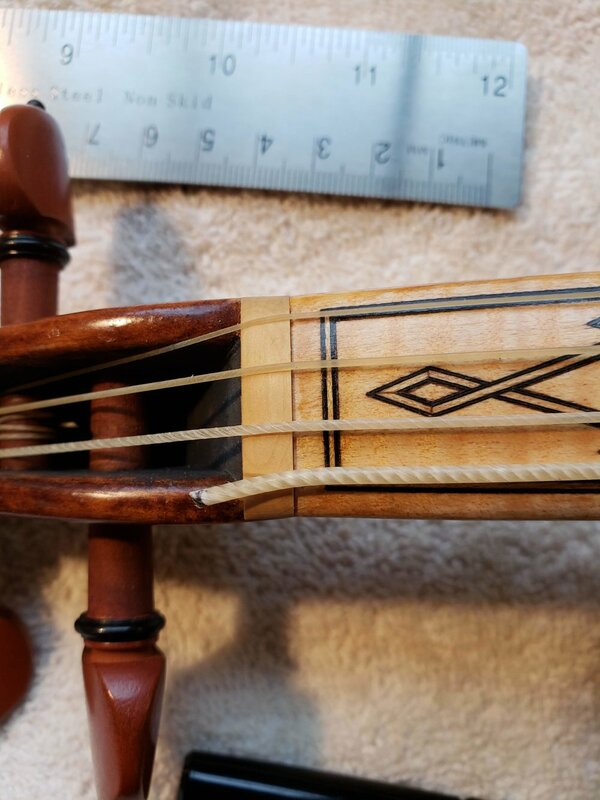 You now have a slip-knot that you can put over the end of the playing string. Pull the slip-knot tight and snug against the mushroomed end of the playing srtring. Cut the leader to a length of about 3”, (7.5cm), or long enough to wrap around the peg a few times. Put the leader through the peg in your usual way. After a little stretching, you will be ready to play.